Welcome to the Freeola Internet customer support pages. 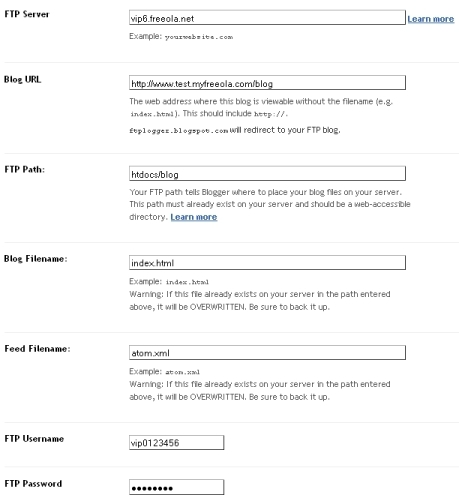 This guide is designed to help with setting your Blogger blog to publish via FTP to your Freeola web space. For more internet help topics please visit our main Support Page. Do you have a Blogger account already but want to use it with your Freeola web space or wish to set an account up using your hosting account you have with Freeola? Then follow this simple guide to doing just that. In order for Google to upload to your web space you will need to have VIP Hosting otherwise Google will not be able to connect via FTP. You can sign up for VIP Hosting here. If you already had a Blogger account you will just need to go straight into your blogging control panel, otherwise you should already be there if you have just signed up. In order to publish your blog via FTP to your web space you will first need to make sure you're using the Classic Template and have set the Blog Readers option to Anybody. To set your theme to classic go to Layout and then Edit HTML. Scroll down to the bottom of the page and click the Revert to Classic Template link. Now to make sure your blog can be read by anybody, go to Settings and then to Permissions. Set Who can view this blog? to Anybody. FTP Server: This will be something in the form of vip5.freeola.net. Blog URL: This is your domain name, however include http:// before it. If you wish to publish to a sub folder, make sure you include it at the end of your domain name e.g. http://www.test.myfreeola.com/blog. FTP Path: This will be htdocs but if you are publishing to a sub folder within htdocs you will need to state that folder too like htdocs/blog. Blog Filename: You can leave this as index.html unless you want to change it. Feed Filename: Again you can leave this as it is unless you want or need to change it. FTP Username: This will be your FTP username provided by Freeola, e.g. vip0123456. FTP Password: This will be your FTP password provided by Freeola. Once you have entered these details fill in the security verification. Then click Save Settings. You should then see a success message, click Republish now to upload your blog. Please note, if you have not yet created any posts you will need to before your blog will appear on your web space. Occasionally it can take a few hours for blogs uploaded using this method to appear 'live'. If your site is not appearing after 24 hours please contact a member of Freeola Support.